Lucky Charms fabric by Ghazal Razavi for Figo is a collection of adorable charms presented as a basic fabric collection. From clovers, to wishbones, to fingers crossed, to shooting stars! This beautiful palette of modern colors can be the stars of the show or great supporting prints. We recommend to handwash with mild, bleach-free detergent, and hang-dry all cotton fabrics for best results. If machine washing is your preferred method, we suggest washing in cold water with like colors on gentle cycle using a mild, bleach-free detergent. Dry on low-heat tumble setting to minimize shrinkage. Cottoneer always recommends to pre-wash a swatch of fabric, in the manner in which you intend to care for your finished project. Letter Embroidery Hoop Craft Kit by The Makery. This cool kit provides you with all the bits and pieces you need to create a cute new decoration for your favorite space. Just choose a letter and stitch away! Perfect for kids just just learning how to embroider! The Dusk to Dawn Quilt Pattern plays with color tones and gradients. There will be 5 different colorways/rows. Each colorway/row contains 4 different fabrics. Make sure that the 4 fabrics in each row have a similar tone and hue. Keep in mind how each row relates to the one below and above it; going dark to ight or light to dark in volume. Comes in two sizes: baby and throw. See inset picture for fabric requirements. Finished Throw Size 55" x 63"
Choose to order yardage by entering a quantity of half yards from the drop-down menu above. Llama Cuddle is a polyester faux fur fabric with a shaggy front side that's cuddly, warm and super soft! Llama cuddle would be excellent used as a backing to a blanket and even used in garment trim applications, like hood linings, and collar trimmings. Please not that this fabric is pretty bulky. We will do our best to ship in the most economical fashion, whether that be by weight or USPS Flat Rate Options. Overpaid shipping will be refunded if applicable. Machine Wash. Tumble Dry Cold. Yarn-Dyed Essex Homespun fabrics have a lovely textured weave consisting of 55% Linen and 45% Cotton. Essex Yarn Dyed Homespuns are the perfect weight for coin purses, makeup bags, and so much more. We love the sophistication they bring to all kinds of sewing projects. Choose to order yardage by entering a quantity of 1/2 yards from the drop-down menu above! Each 1/2 Yard Measures 18″ x 44″ / All fabric is cut in one continuous piece. Fable in Cream | Wildwood by Rifle Paper Co. Wildwood by Rifle Paper Company is the sixth fabric collaboration between Anna Bond and Cotton and Steel Fabrics. Featuring wildflowers and florals in the classic style that we've all come to know and love from Rifle Paper Co. We have the entire collection available to order in bundles and fat quarters! We will always do our best to cut all yardage in one continuous piece. 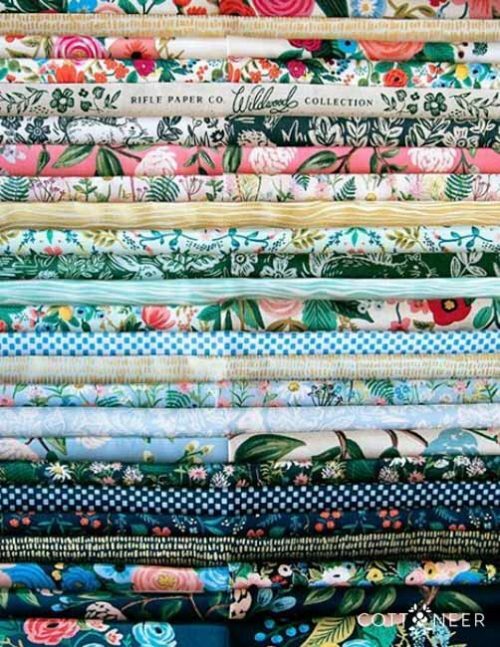 Choose to order yardage by entering a quantity of half yards or fat quarters! Yarn-Dyed Essex Linen Blends are about the most versatile fabric you'll ever find. The simplicity of cotton and linen reigns timeless. We love the natural look and the texture of each piece. Use yours to create napkins, throw pillows, curtains, or a fabulous tote bag. The options are truly endless.